Want to tone your arms and build strength? Looking for space-saving exercise equipment? Then Arm Trainer is for you! Build muscle tone and improve your strength through dynamic, resistance workouts with Arm Trainer. Working out with Arm Trainer targets your triceps, biceps, chest and even your back, allowing you to get the most out of your exercise routine. Tackle flabby arms and start feeling confident in tank tops and halter necks this summer. 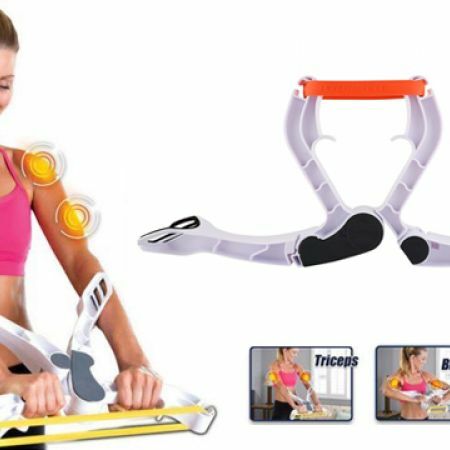 3 different resistance bands make Arm Trainer ideal for beginners, as well as people who want to push their regular work out to the next level. Get the best arm workout - Arm Trainer targets hard to reach areas and stubborn fat with its unique movements. Stop wasting time with traditional workouts and begin seeing an improvement in your muscle tone by using Arm Trainer for just a few minutes a day. Make this the year that you get in shape with Arm Trainer- get yours today!